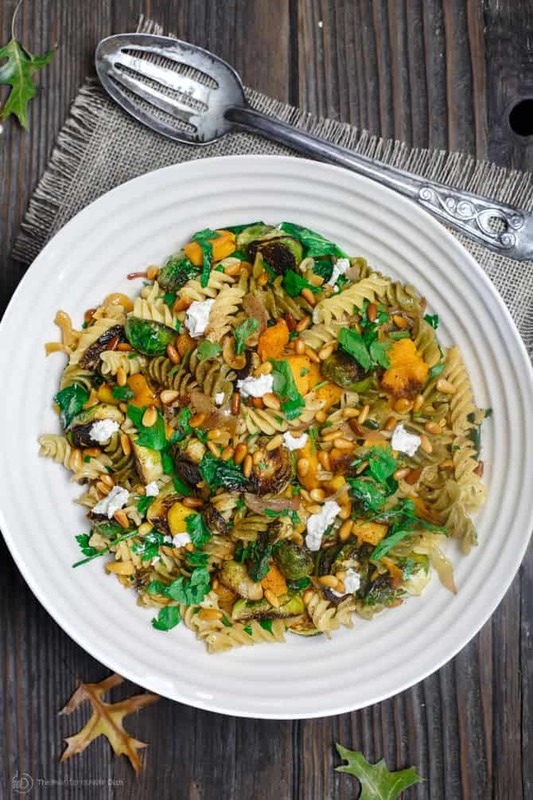 The best way to describe today’s Rotini Pasta Salad is this: simple vegetarian fare. So pretty, it’s like a little fall bouquet in a bowl! A recipe that doubles up as a warm salad and a holiday side dish! See the step-by-step below. This is one of those recipes that are inspired solely by it’s own ingredients, which I happened to have on hand. 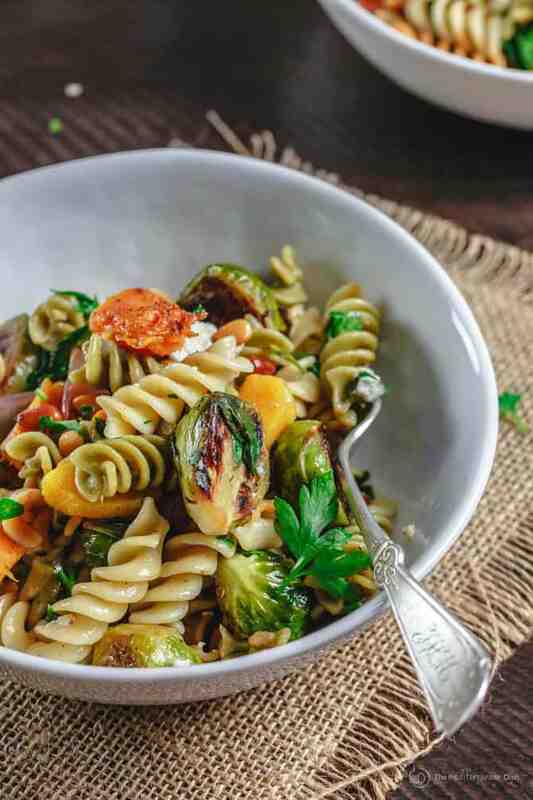 A bag of colorful rotini pasta; frozen butternut squash (because I’m lazy); and brussels sprouts. 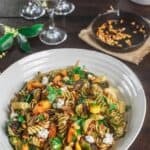 My main goal with this pasta salad was to have everything come together without one ingredient, nor a particular flavor, dominating. 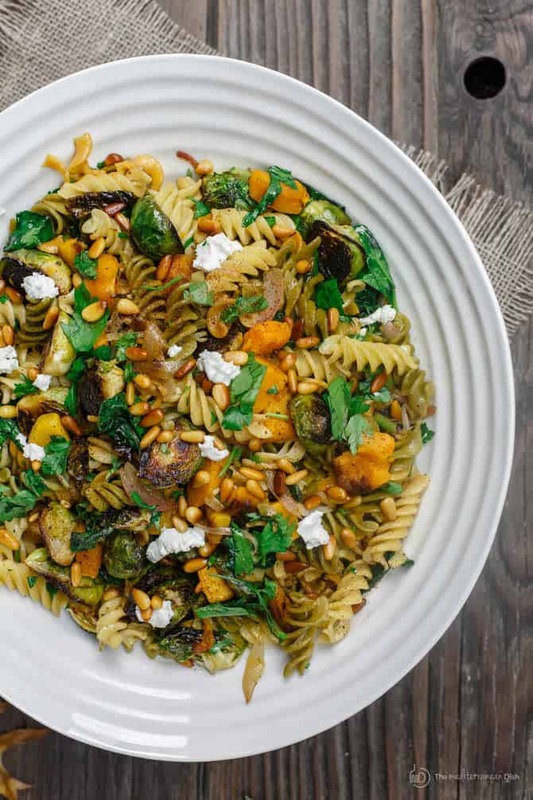 Both the butternut squash and burssels sprouts are cooked in olive oil to the point of charred goodness. Their flavors equally compliment each other. Then, they are tossed into the pasta with supporting leaves like spinach and fresh parsley. The choice of sauce here is kinda benign on purpose. Because, let’s be honest, how often does it feel like the sauce takes over your pasta salad, essentially “suffocating” the life out it?! Not the case here, a sauce of browned butter, olive oil, and shallots is laced through the pasta. It’s there, but it’s not at all overwhelming. 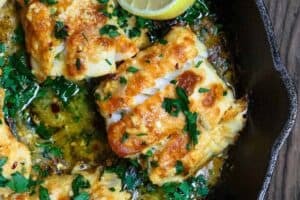 My biggest recommendation is to use a quality extra virgin olive oil because the sauce doesn’t cook for too long. Also, that goat cheese thrown on top at the end? Essential! Cook the Rotini pasta in boiling water according to the package instructions. When ready, drain and rinse the pasta under cold water. Set aside. While the pasta is cooking, heat 1 tbsp extra virgin olive oil in a large cast iron. Add the butternut squash. Cook on medium-high heat, stirring occasionally, until the butternut squash is cooked through. Season with a little salt. Transfer the butternut squash to a dish and set aside for now. 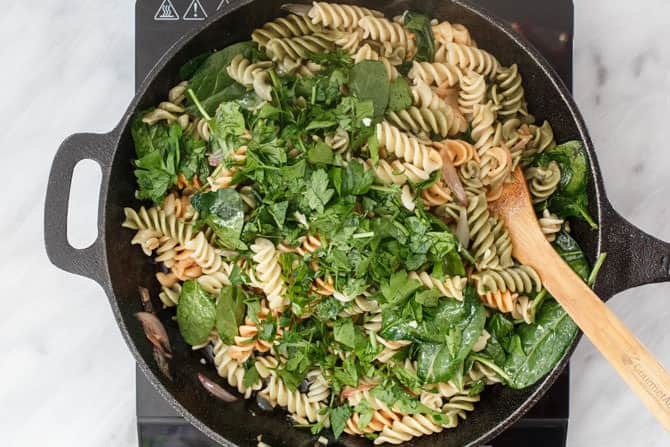 Now, if needed, add 1 tbsp extra virgin olive oil to the same cast iron skillet. Make sure the oil is hot. Now add the brussels sprouts, cut side down, and cook on medium-high heat for 3-4 minutes. Turn the brussels sproutss over on the other side and cook for another 5 minutes until nicely browned and tender. Sprinkle with salt. Transfer to the same dish with the butternut squash for the moment. 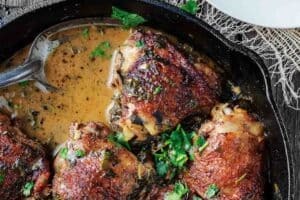 Now make the sauce in the same cast iron skillet. Melt the butter over medium-high heat, swirling occasionally, until the butter is browned and releases a nice nutty aroma. 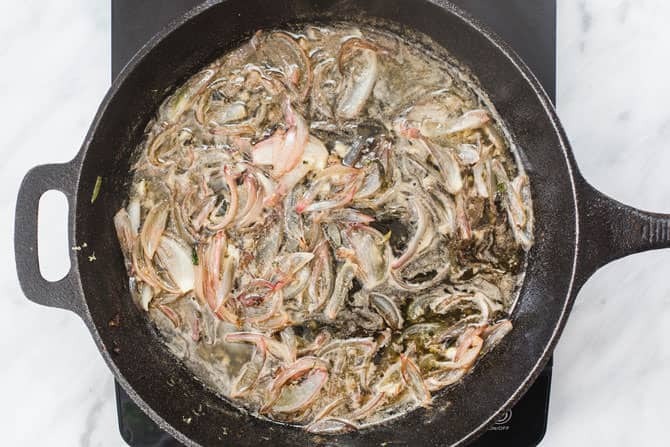 Remove the skillet from heat briefly and add the shallots, marjarom, and garlic. Stir until fragrant (less than 1 minute). Return to medium heat and add the olive oil and lemon juice. Stir in the lemon zest and a pinch of salt. Keep the sauce in the cast iron skillet on medium heat. Now add the cooked pasta to the sauce and stir until the pasta is well coated. Season with a little more salt, black pepper, ground cinnamon, and nutmeg. Stir in the baby spinach and parsley. Then add the cooked butternut squash and brussels sprouts. Cook everything together on medium heat, stirring regularly, until warmed through. Taste and adjust the salt and seasoning to your liking. 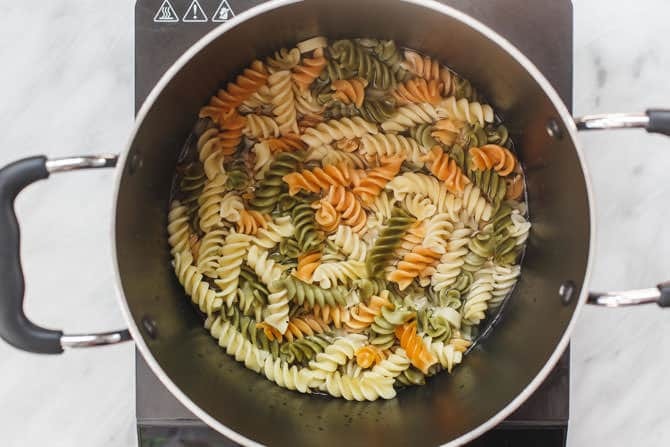 Transfer the warm rotini pasta salad to a large bowl. Drizzle with a little more extra virgin olive oil, if you like. Top with goat cheese and toasted pine nuts. 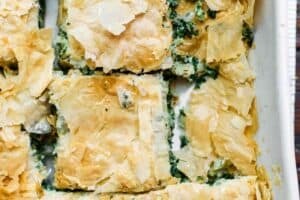 Serve warm or at room temperature with extra goat cheese on the side! Enjoy! 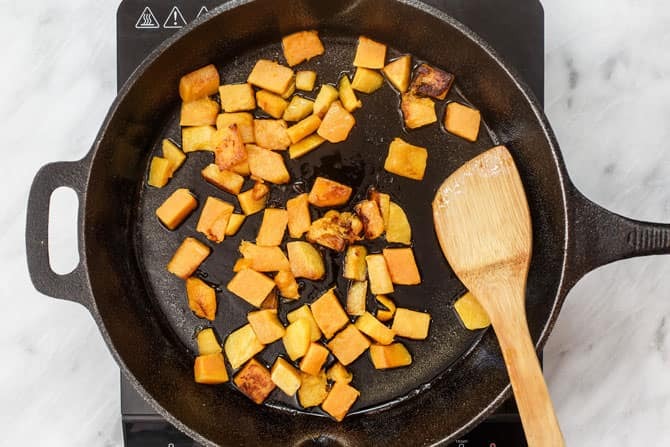 Now cook the butternut squash in a large cast iron skillet like this one with olive oil and just a pinch of salt. See the charred pieces? That’s a good thing! Put the butternut squash into a large dish and leave it aside for now. 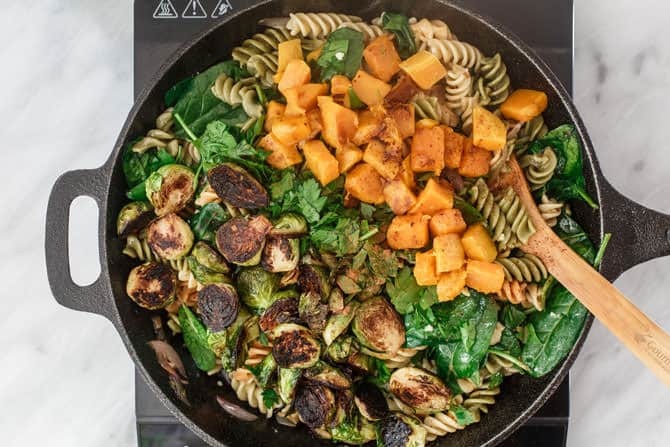 Make the burssels sprouts in the same cast iron skillet. You might need to add a little more olive oil. 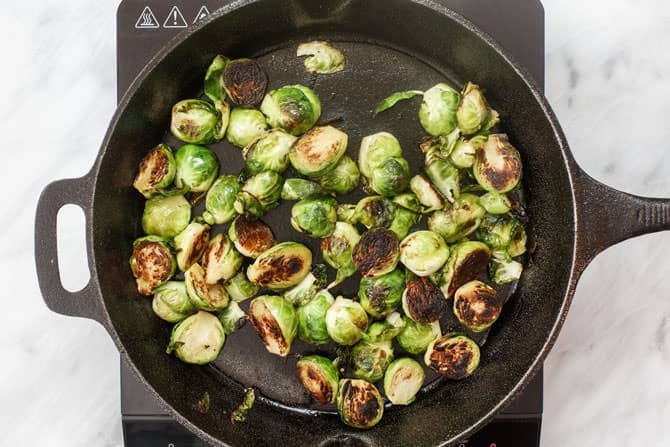 The best way to cook brussels sprouts in a skillet is in hot oil. Sear on one side for 5 minutes or so, and then flip to cook on the other side. You want them nicely charred and tender. Season with a generous pinch of salt. Put the burssels sprouts with the butternut squash for now. In the same trusty cast iron skillet, make the sauce. Start with melting the butter until browned. And off heat, stir in the shallots, marjaroom, and garlic. They will smell fragrant and heavenly! Put the skillet back on the burner and add the olive oil and lemon juice. Add the lemon zest and a generous pinch of salt. Let everything warm through on medium heat. 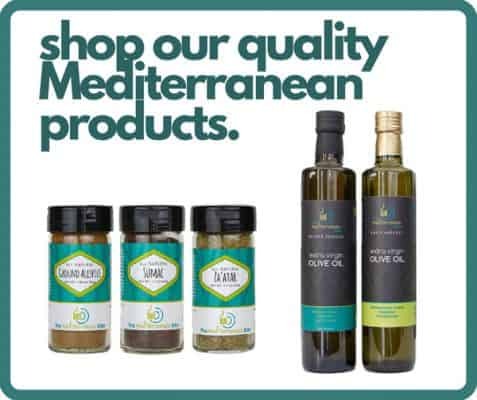 You are not looking to cook the olive oil, that’s why you should use a good quality extra virgin olive oil. Leaving the sauce in the skillet, now add the pasta, pinch salt and pepper, and spices. Stir to make sure it’s coated nicely. Then add in the spinach, parsley, and of course, the butternut squash and brussels sprouts you cooked earlier. Mix everything well together. Taste and adjust the seasoning (I liked adding a little more nutmeg and cinnamon). 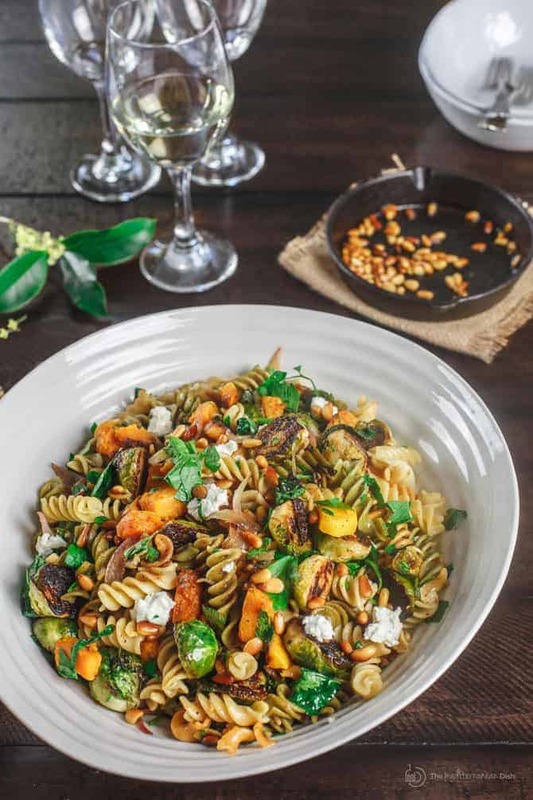 Transfer the lovely fall pasta salad to a large serving bowl. If you need to, feel free to drizzle a little more of that good olive oil and toss. Then top the pasta with lots of goat cheese (it makes a difference), and toasted pine nuts. Enjoy! I make this recipe every time I find good looking brussels sprouts, which is often. And every time my husband says “this tastes like something they would feed you at a fancy restaurant”. Thank you for sharing this! Awww….that’s awesome to hear, Missy! Thank you! I cannot eat Brussels Sprouts. I wonder what I could substitute for them? Really any roasted vegetable you enjoy will work here. Zucchini for example, although not a fall ingredient, will work here. Made this today. It is delicious!! Yay! So glad to hear it, Cyndi! Is there a good substitute for the Marjaram? I haven’t seen fresh in any local stores. You can change things up here, Jenny. You can use a different fresh herb or spice. This recipe is quite forgiving. Is the first time that I see this kind of pasta been called Rotini, I thought that the name was fussilli.You never finish to learn things in life. WOW! 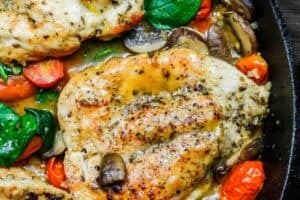 Just finished this recipe and it is everything I love about fall in one dish! The nutmeg took it over the moon! I didn’t have pine nuts on hand and chose to use a fresh Butternut squash, so I toasted up the seeds and it was deliciousness too. Thank you for this creative recipe! Bonnie, thanks so much for giving this recipe a try! And thanks for sharing your tips…always fun to see how others adapt a recipe. Thanks again! Would adding dried cranberries be good?! Ashley, so sorry I hadn’t been able to log in the last couple days…just saw this comment. Yes, you can certainly add cranberries or any dried fruit here. This is a simple recipe and the flavors are fairly neutral, so you can make additions as you like. Hi Dawn! So sorry I didn’t see your comment earlier. I like your idea of making all the components then assembling together…I would even assemble a few hours before dinner and let flavors develop. Taste and see if you might like to adjust anything right before dinner. This is a fairly mild one. Enjoy! 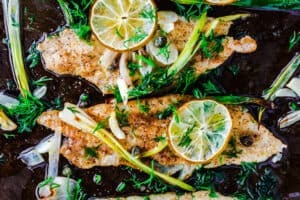 Can you make ahead and refrigerate overnight? Then serve the next day at room temp? Do you defrost the butternut squash prior to cooking? No…no need to defrost! Enjoy! Wow, perfect balance of flavours. Thanks so much! Thank you, Trish! Glad you liked this one! Just what I have been looking for, all the perfect ingredients and I know my family is going to love this!! thank you Suzy!